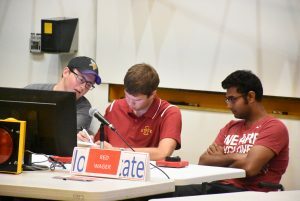 In the end, it was their knowledge about traffic safety that drove the Iowa State University (ISU) team to victory in the Institute of Transportation Engineers’ Traffic Bowl Midwestern championship. The team’s come-from-behind win led to their first championship victory since 2015. 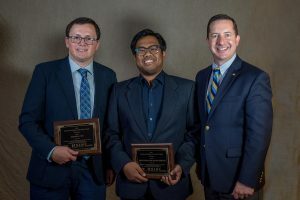 ISU’s Institute for Transportation (InTrans) graduate students Ashirwad Barnwal, Justin Cyr, and Jacob Warner competed among eight teams in the Midwestern District. The competition is akin to “Jeopardy” — except the clues are drawn from sources like the Manual on Uniform Traffic Control Devices and the Traffic Engineering Handbook. But it wasn’t just knowledge that led to their victory. In fact, the team said they felt underprepared heading into the competition. What they did have was good team work. Their win in the Midwestern District allowed them to compete among nine teams just four days later in the ITE Collegiate Traffic Bowl Grand Championship. Warner said, however, he went into the international grand championship competition with low expectations, though he was anxious there would be a more competitive feel. Instead, he saw quickly that the other teams were just there to have fun, and most of the teams spent time hanging out after the game ended. Though they had some early success in the grand championship with Warner correctly surmising a question on Canadian highway capacity, it did not last long enough to propel them to victory. What ultimately caused their loss in the international championship was a question on signalized intersections. “We were eliminated because we didn’t know the answer to a question, it’s as simple as that. It might be a different story if we were eliminated because of a questionable judging decision, but we were glad to have made it to the international championship,” Warner said. Despite their loss at the international level, there was not much disappointment. “It was an amazing experience, especially for me, because it was my third time competing for the Midwestern Traffic Bowl championship, and the first time we won,” Barnwal said. It was slightly different for teammate Cyr, who competed in and won in his first appearance in the Traffic Bowl. “Although we didn’t win the grand championship, it was a fun competition that engages students in ITE,” Cyr said. Megat Usamah Megat Johari and Justin Cyr took first place in the 2018 Highway Safety Information System (HSIS) Excellence in Highway Safety Data Award Competition. Georges Bou-Saab won the best student poster award. 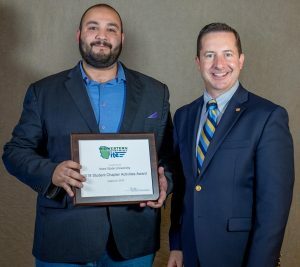 Bou-Saab was also part of the Leadership ITE Class of 2018 for the Midwestern District, and the only student among that group. ISU’s Transportation Student Association won the outstanding student chapter award of the ITE’s Missouri Valley Section and the Midwestern District student chapter award.